Reason #47 why I love my husband: He has deemed Sundays "Pizza and Football Day." That's right. He makes the pizza. Then we eat the pizza, drink beer, and watch football together. If you're thinking, "But she just announced she has celiac disease. Why is she posting about pizza?" Here's my response: I'll still be posting carby Italian recipes like pizza and pasta. After all, Jeff isn't gluten-intolerant. However, I'll also be posting gluten-free recipes. So, rather than having less, Food Blogga will have more! Now for the pizza. When struck with a serious hankering for a Philly Cheesesteak last Sunday, Jeff decided to make a Philly Cheesesteak Pizza instead -- a macho pie of succulent sauteed sirloin steak, sweet caramelized onions, and smoky cheddar cheese. After the first bite, I thought his Philly Cheesesteak Pizza couldn't be improved upon. I was wrong. Reason #48 why I love my husband: He suggested adding a scoop of mouth-puckering, salty giardiniera to our pizza. Touchdown! This pizza recipe was created by Jeff Benabio, aka @dermdoc, Food Blogga's husband. It should feed eight people; it will likely feed four; for the truly gluttonous, it will feed two. 1. Roll out the dough and brush all over with 1 teaspoon olive oil. Cover with a dish towel and set aside. 2. In a large skillet over medium-high heat, add 1 tablespoon olive oil. Add steak and sprinkle with salt and black pepper. Cook for 4-6 minutes, turning once or twice, until lightly browned and just barely pink. Transfer to a plate. 3. In the same skillet over medium-low heat, add 1 tablespoon olive oil. Add onions and sprinkle with sugar. Cook stirring occasionally for about 10-12 minutes or until softened and browned. Remove from heat. 4. Sprinkle half the cheese evenly over the dough. Arrange the steak on top, then arrange the onions. Sprinkle evenly with crushed red pepper flakes, salt, and then remaining cheese. 5. For a pizza stone, bake at 500 degree for about 10 minutes, or until both the top and bottom of the crust is brown and the cheese is melted. For a baking sheet, bake at 450 for about 20 minutes, or until both the top and bottom of the crust is brown and the cheese is melted. Serve hot or at room temperature, and garnish with a spoonful of giardiniera. *Shopping Note: Giardiniera, an Italian pickled vegetable salad, can be found at Italian specialty markets or in the Italian or condiment section of most major supermarkets. Philly cheesesteak pizza?! I think this will become a favorite in my house. That is great looking pizza that your husband made. It seems that we are having a celiac disease epidemic. Has it just been misdiagnosed in the past? 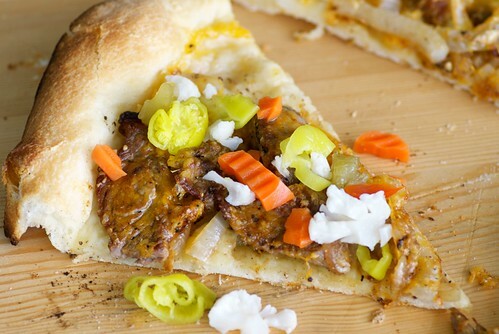 omg my husband is DROOLING over that philly cheesesteak pizza, it looks awesome! Thanks so much for the mention :) I can't wait to see what delicious gluten free goodies you come up with! Now that is a terrific pizza! I love the choice of toppings. Kudos to the hubby-great looking pizza! With pizza this delicious, I am ashamed to say I count myself among the severely gluttonous. You see I didn't think that philly cheesesteaks could get better. But obviously they can. We all know Jeff is a sweetie, but a sweetie who also makes pizza -- well, that is over the top! That looks awesome! And cheddar is the only "orange" cheese I can handle on my cheesesteaks! What a wonderful pizza, Susan! Sorry to hear you have celiac but it's not the end of the world. I've been baking gluten-free lately and absolutely love it so don't worry you can still make all the things you like without gluten. Maybe the hubby won't mind sharing your diet. This is a macho kind of a dish Susan, but we gals will love it too. What a wonderful (and Manly!) pizza! Kudos to Jeff. I'm sorry to hear about your gluten intolerance, Susan, but glad that you've been diagnosed and can now eat the right foods. I detected gluten intolerance in myself last year and have struggled with it on my blog, not wanting to give up posting gluten-rich foods yet needing to acknowledge my change in eating patterns. I'm glad to see that you will be doing both and will take direction from your clever tack. the thing abt homemade pizza is that u can pile (and i mean really pile) all the thing u love! that looks yummss! Susan - thanks so much for linking to my post. I'm glad to see you're as crazy about pizza as I am! Yes, this would probably feed two at my house! Yes! This is on my "pizza combo to try next" list (yes, that's a real list in my house!). Thanks for link to my Mexican pizza- totally appreciate it. Wow, how did you train him to create such wonderful pizza! Now you just have to get him to declare Sunday a day of rest for you and a day of cleaning for him, and it will be perfect!